Lineage. Designated as 87 Aero Squadron, and organized, on 18 Aug 1917. Redesignated Squadron B, Park Field, on 25 Jul 1918. Demobilized on 1 Dec 1918. Reconstituted, and consolidated (1 Dec 1936) with unit constituted as 87 Pursuit Squadron on 19 Feb 1935. Organized on 1 Mar 1935. Inactivated 1 Sep 1936. Demobilized on 1 Jan 1938. Reconstituted, and consolidated (21 Mar 1979) with unit constituted as 87 Pursuit Squadron (Interceptor) on 13 Jan 1942. Redesignated 87 Pursuit Squadron (Interceptor) (Twin Engine) on 31 Jan 1942. Activated on 9 Feb 1942. Redesignated: 87 Fighter Squadron (Twin Engine) on 15 May 1942; 87 Fighter Squadron, Single Engine, on 21 Aug 1944. Inactivated on 15 Jul 1947. Redesignated 87 Fighter-Interceptor Squadron on 11 Sep 1952. Activated on 1 Nov 1952. Inactivated on 8 Sep 1955. Activated on 8 Apr 1956. Inactivated on 1 Oct 1985. 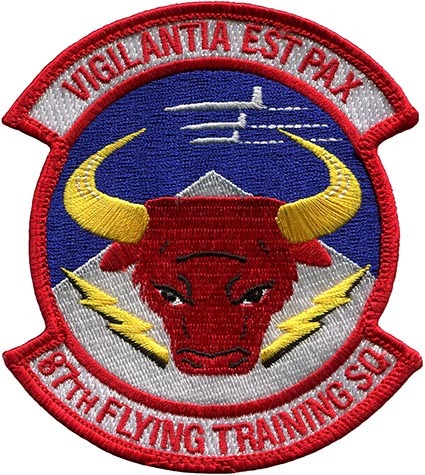 Redesignated 87 Flying Training Squadron on 9 Feb 1990. Activated on 2 Apr 1990. Assignments. III Corps, Observation Group, 18 Aug 1917-1 Dec 1918. 20 Pursuit Group (attached to the Air Corps Tactical School), 1 Mar 1935-1 Sep 1936. 79 Pursuit (later, 79 Fighter) Group, 9 Feb 1942-15 Jul 1947. 31 Air Division, 1 Nov 1952; 521 Air Defense Group, 16 Feb 1953; Third Air Force, 21 Dec 1954-8 Sep 1955. 58 Air Division, 8 Apr 1956; 30 Air Division, 1 Sep 1958; Detroit Air Defense Sector, 8 Apr 1959; 34 Air Division, 1 Apr 1966; 343 Fighter Group, 30 Sep 1968; 23 Air Division, 28 Aug 1970; 21 Air Division, 1 Aug 1981; 24 Air Division, 23 Sep 1983-1 Oct 1985. 47 Flying Training Wing, 2 Apr 1990; 47 Operations Group, 15 Dec 1991-. Stations. Kelly Field, TX, 18 Aug 1917; Selfridge Field, MI, Sep 1917; Park Field, TN, Dec 1917-1 Dec 1918. Maxwell Field, AL, 1 Mar 1935-1 Sep 1936. Dale Mabry Field, FL, 9 Feb 1942; Morris Field, NC, 1 May 1942; Rentschler Field, CT, 25 Jun-28 Sep 1942; Egypt, 12 Nov 1942; Libya, 24 Jan 1943; Tunisia, 13 Mar 1943; Malta, 4 Jul 1943; Sicily, 17 Jul 1943; Southern Italy, 15 Sep 1943; Salsola, Italy, 4 Oct 1943; Madna Airfield, Italy, 17 Nov 1943; Capodichino, Italy, 17 Jan 1944; Pomigliano, Italy, 1 May 1944; Corsica, 11 Jun 1944; Southern France, 22 Aug 1944; Iesi, Italy, 4 Oct 1944; Fano, Italy, 6 Dec 1944; Cesenatico, Italy, 21 Mar 1945; Horsching, Austria, 27 Jul 1945-25 Jun 1947; Langley Field, VA, 25 Jun-15 Jul 1947. Sioux City Muni Aprt, IA, 1 Nov 1952; Bentwaters RAF Station, England, 13 Dec 1954-8 Sep 1955. Lockbourne AFB, OH, 8 Apr 1956; Duluth Intl Aprt, MN, 30 Sep 1968; K.I. Sawyer AFB, MI, 1 May 1971-1 Oct 1985. Laughlin AFB, TX, 2 Apr 1990-. Aircraft. Unkn, 1917-1918. Unkn, 1935-1936. P-40, 1942-1944; P-47, 1944-1947. F-51, 1952-1953; F-86, 1953-1955. F-86, 1956-1958; F-102, 1958-1960; F-101, 1960-1968; F-106, 1968-1985. T-38, 1990-. Operations. Combat in Mediterranean Theater of Operations (MTO), 14 Mar 1943-7 May 1945. Air defense, 1952-1955 and 1956-1985. Undergraduate and special undergraduate pilot training (UPT/SUPT), 1990-. Campaign Streamers. World War II: Egypt-Libya; Tunisia; Sicily; Naples-Foggia; Anzio; Rome-Arno; Southern France; North Apennines; Po Valley, Rhineland; Air Combat, EAME Theater. Decorations. Distinguished Unit Citations: North Africa and Sicily, Mar-17 Aug 1943; Italy, 16-20 Apr 1945. Air Force Outstanding Unit Awards: 1 Jul 1976-30 Jun 1978; 4 May 1981-3 May 1983; [2 Apr 1990]-15 Mar 1991; 1 Jul 1991-30 Jun 1993; 1 Jul 1993-30 Jun 1994; 1 Jul 1997-30 Jun 1999; [1 Jul 1999]-30 Jun 2000; 1 Sep 2003-30 Jun 2005; 1 Jul 2005-30 Jun 2007. Emblem. Approved on 12 Feb 1969; replaced emblems approved on 16 Jul 1956 and 1 Aug 1945.